The Boston Red Sox sure love bobbleheads. Of 13 promotional dates on the 2019 schedule, the team is planning to give away six bobbleheads, starting with a J.D. Martinez Home Run Counter in May and ending with a Nathan Eovaldi World Series version in September. In between, fans at Fenway Park can pick up replica World Series rings from each of the four titles this decade, as well as a handful of logo gear. 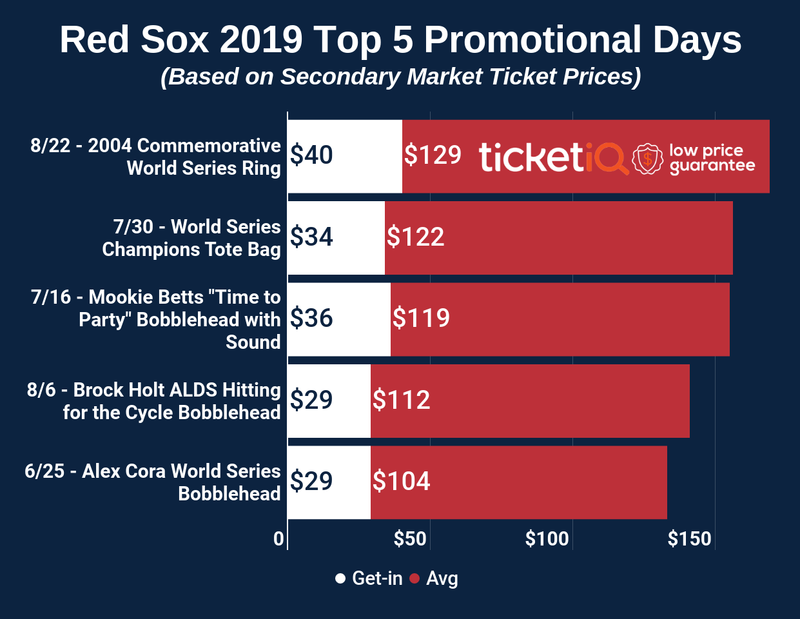 The average asking price for a ticket to see the defending World Series champions at home is $125 on the secondary market, according to secondary ticket marketplace TicketIQ.com, and the average asking price for tickets to promotional games is $91. For each of the 13 promotions, the first 7,500 people into the park will receive the free gift. The Red Sox open on the road in Seattle on March 28, and at Fenway Park against American League East rival Toronto on April 9. Below is a look at each of the Red Sox promotional games. For the second game of the season against the Blue Jays, fans will be treated to a replica 2018 World Series ring. Boston has won four World Series since snapping the 86-year-old “Curse of the Bambino” in 2004. This promotion will be two days after Boston raises its latest World Series flag. At this game against the Detroit Tigers, the Red Sox will give away “Win Wall” flags, which feature a likeness of the team’s “Win Wall,” with the caption: “119, Damage Done” to the left. Always a fan favorite, Mookie Betts will be celebrated with an MVP hat at this game against the Oakland Athletics. Betts, who was the AL batting champion, a Silver Slugger and a Golden Glove in 2018, was also the regular-season MVP. The American League’s RBI leader in 2018, J.D. Martinez’s seventh-inning home run in Game 5 of the World Series was instrumental in Boston winning that game and the Series. Last season was Martinez’s first in Boston. Early fans to this game against the Colorado Rockies will get this unique bobblehead. For another shot at a World Series replica ring, fans can head out to this game against the Texas Rangers. Boston won the 2007 World Series by sweeping the Colorado Rockies. Who better deserves a bobblehead than a first-year manager who wins a World Series? That’s exactly what Alex Cora did in his debut season as an MLB manager. Fans to this game against the Chicago White Sox can take home his likeness in a World Series bobblehead. According to TicketIQ.com, the average asking price for a ticket to this game is $104. More Mookie! In what’s likely the most unique bobblehead of them all, Boston will be giving away a bobblehead with sound, which will presumably be the Red Sox 2018 mantra of “It’s time to par-tayyyy!” Boston will play the Toronto Blue Jays, and tickets for this game are trending at $119 on the secondary market. The second priciest promotional game of the season, this game has an average asking price of $122, well over the promotional game average of $91. Only the August 20 2004 Commemorative World Series Ring game is pricier. The Red Sox will host American League East rival Tampa Bay. The Red Sox are rewarding Holt’s unusual accomplishment with a unique bobblehead, and fans have driven the average asking price for this game up to $112. Boston will host Kansas City. The priciest promotional game of the season, early fans to this game will get a 2004 replica ring commemorating the World Series victory that snapped an 86-year drought. Demand has driven the price of this game against the Philadelphia Phillies up to $129. The catch that played a key role in sending the Red Sox to the World Series last season was Andrew Benintendi’s diving outfield scoop that robbed Astro Alex Bregman of a bases-loaded hit and ended Game 4 of the ALCS. For a bobblehead to remember it by, fans can make their way out to the ballpark for this game against the Minnesota Twins. Fans might remember Nathan Eovaldi as the pitcher who gave up the home run that ended the historic 18-inning World Series Game 4, but he was also the Red Sox go-to reliever in the World Series and winner of two other playoff games. This game against the San Francisco Giants has an average asking price of $96, which is $5 more than the promotional game average asking price.